A gorgeous Bonsai can add visual drama in your living space..like it does in my living room! Dear Aalayam Family - I am privileged to present to you Bonsai, a wonderful accent to your living space and a quintessential and sustainable way to bring the outside..in! The age old Japanese art form that so elegantly captures the grace and beauty of full-grown trees in motley containers of your choice! The Japanese word "bonsai" (bon - 'basin', sai - 'plant') refers to a plant, tree or a group of trees or plants growing in a container. Bonsai is a living art form that can provide a lifetime of joy to botanists and aficionados and natural eye-candy to design enthusiasts all over the world. Harmonize your end table or coffee table with a Bonsai and some of your favorite picture frames or accessories! A picture from my family room. 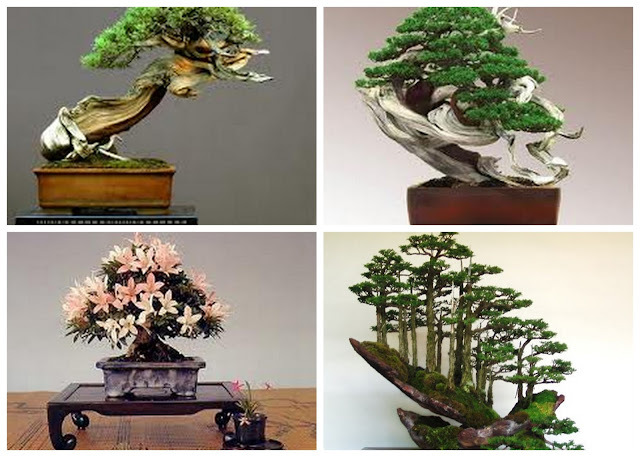 The first examples of penjing, the Chinese version of bonsai, and bonsai were made from trees and plants collected from the wild mountains areas within China and Japan. Indigenous, naturally stunted trees were arranged and planted in ceramic pots and containers, kept in or around collectors' homes, and regarded as natural works of art. Bonsai trees and plants are often contorted into interesting shapes, structured by the bonsai artists' loving hands to mimic old, gnarled trees found in nature. From the time a bonsai is created, it's shaped to limit growth, redistribute the vigor of its foliage to areas requiring further development. Root reduction, pruning and potting a Bonsai ..lovingly rendered on a Juniper by my mom! My mother is a proud collector of over 150 Bonsais. She has one as old as me (well, almost) in her collection. As the story goes, she snipped a little ficus seedling off of a fence just after my 1st Birthday and created a Bonsai out of it. Today, that very Bonsai tree stands magnificent in my mom's terrace garden in India, making a grand appearance into my parents' living room during dinner parties. On my parents' recent visit here, I coaxed my mom to design a few Bonsais for me. The montage of pictures you see above is the photographic capture of the process of root reduction, pruning and potting of my very first Bonsai! My Green Sargent Juniper suns itself on my backyard bench! 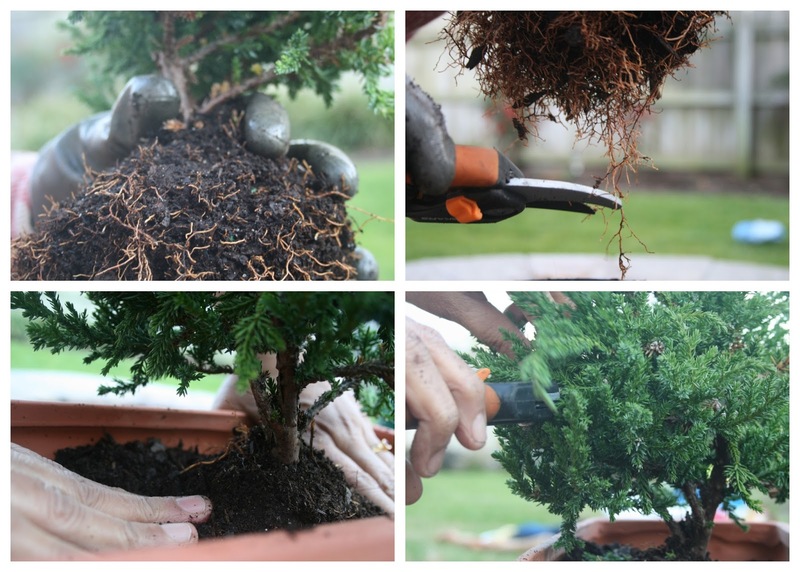 The practice of Bonsai development incorporates techniques like leaf trimming, pruning the trunk, branches, and roots of the candidate tree, wiring branches and trunks to allow the bonsai designer to create the desired general form, clamping using mechanical devices for shaping trunks and branches, grafting new growing material (typically a bud, branch, or root) into a prepared area on the trunk or under the bark of the tree, defoliation, which can provide short-term dwarfing of foliage for certain deciduous species and Deadwood bonsai techniques called jin and shari that simulate age and maturity in a Bonsai. Create a feeling of zen in your room with Bonsai! Bonsai aesthetics generally adhere to Japanese cultural characteristics, in particular the influence of Zen Buddhism and the expression of Wabi-sabi (acceptance of transience and imperfection). Some of the aesthetic mantras to follow while designing a Bonsai are: Miniaturization: where a bonsai is kept small enough to be container-grown while otherwise fostered to have a mature appearance, Proportion among elements: where the proportions mimic those of a full-grown tree as closely as possible, Asymmetry: where strict radial or bilateral symmetry in branch and root placement is discouraged and Poignancy: where the grower creates a tree that expresses Wabi-sabi. The Complete Practical Encyclopedia of Bonsai: The essential step-by-step guide to creating, growing, and displaying Bonsai with over 800 breath taking photographs. If you are a beginner, and would like to enjoy the zen of Bonsai without crafting one, why not buy one for your living space. Beautiful Bonsais are available for sale in local nurseries, and neighborhood super stores all over the country. What better way to get the outdoors into your home than with a beautiful Bonsai? I hope this feature post has brought out the nature lover in you. I for one, sure enjoyed sharing my new found passion with you, my dear Aalayam family! I leave you with another picture from my home. A cozy window seat, a Bonsai, a book and some herbal tea...how much more zen can it get? Bonsai - Bring the outside in!